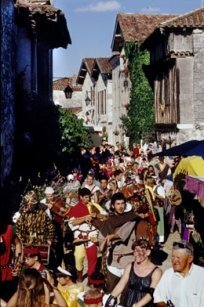 Pujols is classed among the ”Most beautiful villages of France”. The ancient medieval town is perched at an altitude of over 180 metres, dominating the Lot valley. Pujols Le Haut, an ancient stronghold, has known an eventful past. Destroyed during the Albigensian war , it was then rebuilt. A large part of its 13th century heritage has been wonderfully preserved. The town is still surrounded by a part of its ramparts and the bell tower of the old seigneurial chapel still stands today guarding entrance to the town. Around the central square stand superb half-timbered houses. As for the covered market, it was built in the 19th century with materials from the old church.